When you are out on the golf course, focused on shooting the best round you can, the last thing you want to worry about is trying to find the right club when you need it. 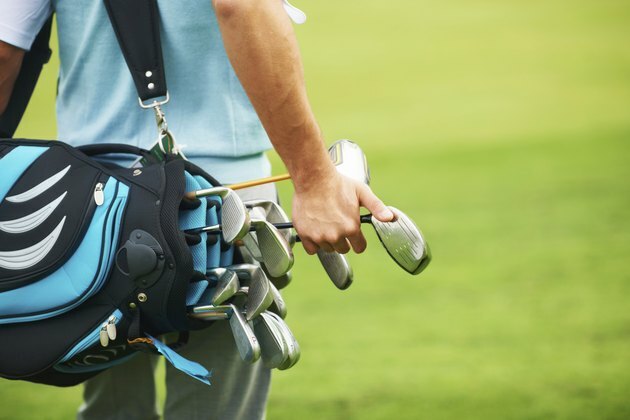 Many golfers don't give the topic of golf bag organization a second thought, but it can make a huge difference in terms of balance if you are carrying your clubs. Remove all of the clubs from your golf bag. Also, unzip any side pockets and remove the contents. Most golf bags have three sections to hold clubs. You will organize your clubs depending on how your bag will travel around the course. Place the shorter clubs in the bottom compartment if you are going to carry your bag around the course. These include your 7, 8 and 9 irons, as well as your pitching wedge and sand wedge, if you have one. Place your mid to long irons in the middle compartment of the bag. These include your 3 to 6 irons, and your 2 iron if you carry one. Slide your woods into the top of the bag. Include any hybrid clubs you may have, as well as your putter. Placing the putter in with the woods will prevent it from banging against your irons and causing damage. Distributing your clubs in this fashion will make them easy to find and create balance in your golf bag if you carry your clubs. Reverse the order of the woods and short irons if you decide to strap your bag onto a golf cart. You want the taller woods at the back, wherever your bag happens to be, so that they won't block out your shorter clubs when you are looking for them. Fill one of your side pockets with golf balls and tees. If you have a long section that extends the length of the bag, use it for your shoes. Leave one small section empty to store any food or drinks you bring onto the course.